1. Stuff a paper bag with wrinkled up scrap paper, used plastic bags, or other recycled products. 2. Bring the sides of the paper bag together, fold down one side of the top of the bag and then the other into a pointed shape to make the beak. Glue the folds closed. You can glue a small magnet to the inside of the beak and one to the stomach. The magnets will keep the beak down, and the penguin can be used to hold note paper. 3. Cut wings and feet shapes from card stock and glue them to the bag. 4. Paint the bag to look like a penguin. Glue the beak down to the stomach if you aren't using the magnets. 5. Cut pipe cleaners and glue them to the penguin's face to make the crest. To finish glue on wiggle eyes. 1. 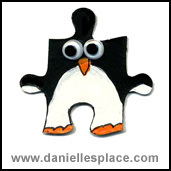 Paint the puzzle pieces with acrylic paints and then outline the painted shapes with permanent marker. 2. When the paint dries glue on googly eyes. 3. Use a permanent marker to draw in the mouth. 4. Glue a magnet or tape a pin to the back of the pieces to make refrigerator magnets or brooches. 1. Print out the pattern onto card stock (heavy paper) that matches your cup color. Cut out the patterns. 2. Paint the paper cup with black paint to make it look like a penguin and let it dry. 3. Punch a small hole in the middle of the bottom of the paper cup. Cut a piece of yarn or string about two feet long. Poke one end of the string through the hole to the inside of the cup. Put your hand inside the cup and pull the string down. 4. Tie a big knot about six inches from the end of the string. Pull up on the string from the outside of the cup to bring the knot up against the bottom of the cup, make sure it won't come out. 5. Punch a hole in the feet pattern on the circle and stick the pattern up inside the cup to the position you would like it to hang. Note where the hole meets the string and tie the feet to the string at that point. 6. Glue or tape on the wings, eyes, and beak. 7. Tie the other end of the string to the middle of a craft stick about six inches from the bottom of the cup. 7. Punch tiny holes in the toe of each foot and tie a piece of thread to the feet. Tie the other end of the thread at each end of the craft stick. Make sure the thread is long enough so that the legs hang down freely. 8. Move the ends of the craft stick up and down to move the feet. 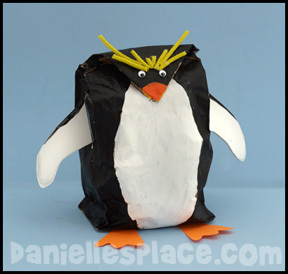 Puppet Play - Assign each child a different type of penguin and have him or her research it online. Tell your children to paint their cups to resemble the type of penguin they are assigned and learn facts about that penguin. Put on a puppet skit. Pick two children to pretend their puppets have just met. The puppets will ask each other questions such as: What's your name, what kind of penguin are you, where do you live, etc. 1. Clean and dry out the milk jug. When it is completely dry pour a few cups of sand or pebbles into the jug and screw on the lid. 2. Paint the jug with black and white acrylic paint and let dry. 3. Cut the wings, beak and feet from fun foam and glue to the jug. Glue on googly eyes. 4. Add a hat to give your penguin character. Children can use this writing sheet to write facts about penguins, words that start with the letter "P", or write a short story. This sheet doesn't have any lines for writing. It can be used as a coloring sheet. It can also be used to make a water color picture if you print it out on heavy paper. Have your children draw a design, such as feathers with crayons and then paint over the picture with water color paint. Children can also glue pictures that start with the letter "P" on the penguin's belly, or draw a winter scene on his belly. 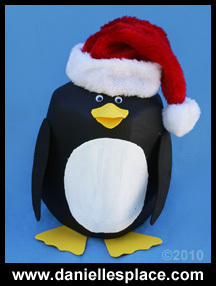 Children can also make up their own story and use the felt penguin to make their own book. You can either take pictures of the felt characters for each page, or make extra felt characters and make a touch and feel book. To make a felt board tape or glue blue felt material onto a piece of foam core board. Use fiberfill for the clouds and mountain. 1. 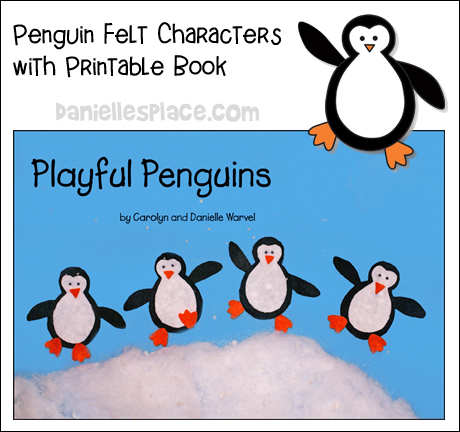 Print out the felt penguin patterns and cut them out. There are two different sizes of patterns. 2. Pin the patterns on the the felt sheets and cut them out. 3. Glue the body pieces together. Leave the wings, feet, and beak separate so your children can change the positions as needed. 4. 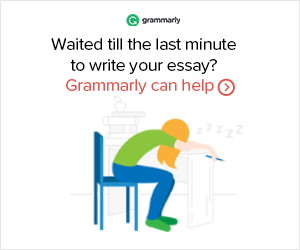 Print out the book, cut the pages apart, and staple them together. 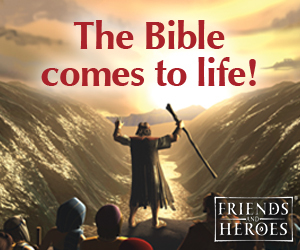 If you don't want to print out the book, you can use the online book below. PENGUIN Cookie Cutter 5 IN.